Two young women who share a past secret—one now an ambitious journalist, the other a cop—must join forces to stop a vicious killer no matter the risk in this nail biting debut from an international bestselling author. Recent graduate Freddie Venton is desperate to get her journalism career started. She cultivates contacts online, writes for free for digital publications, and earns minimum wage as a barista. She’s been taught to “seize the story,” and she takes a reckless chance when a face from her past leads to a juicy scoop. Freddie hasn’t seen her old friend Nasreen Cudmore in years. But when she learns Nasreen is a police officer after a chance encounter outside her coffee shop, Freddie makes a snap decision to follow her when Nasreen gets an urgent callout. Impersonating a forensics officer, Freddie visits Nasreen's crime scene where a man’s body lies slumped over his computer. With the police banned from, and unfamiliar with, social media, it’s Freddie who realises the victim was a troll and finds @Apollyon: a twitter account whose profile picture shows the dead body and the missing murder weapon. The “Hashtag Murderer” posts cryptic clues online, pointing to the next target—taunting the police, enthralling the press and the public. When @Apollyon follows her, Freddie’s afraid she might be next. 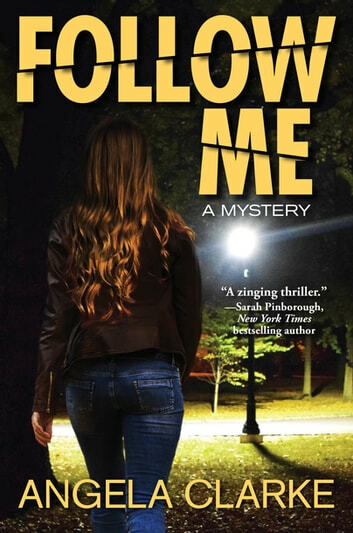 Time is running out as she and Nasreen face a desperate struggle to catch this cunning, fame-crazed killer—and to escape their past demons in Follow Me, a chilling procedural debut from critically acclaimed, up and coming talent Angela Clarke. Fast-paced, exciting read. A scary look into today's technology and social media, with a strong plot and interesting characters. Good read.